Participants stroll along the midway at the 2019 Polar Plunge in outer East Portland, before taking a quick and cold dip in the Columbia River. Having a reported loss of $325,000 on $4.5 million in revenue in 2016, and stating continuing losses 2017 and 2018, Special Olympics Oregon (SOOR) announced the suspension of their 2018 summer and fall games and their 2019 winter games because of financial problems. 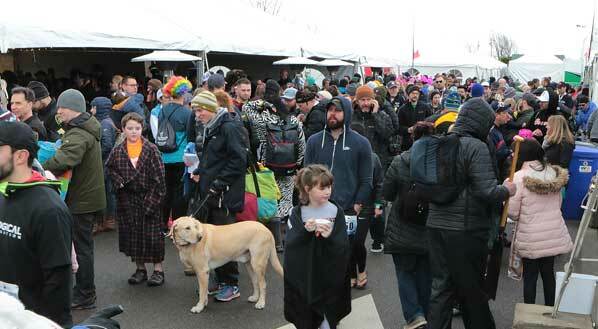 In addition to the loss of services and evens for SOOR, many thought an annual madcap outing, the Polar Plunge into the Columbia River, would also be cancelled. 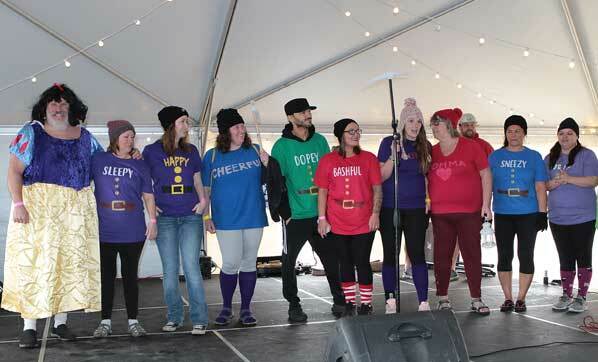 This team, Cinderella and the Seven (no, Nine) Dwarfs, from the Wood Village Fred Meyer, enter and place in the Polar Plunge costume contest. 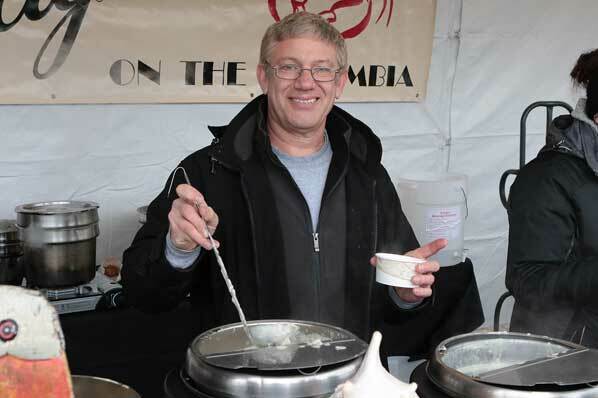 A popular man at the event, Troy Baker, Salty’s on the Columbia Facilities Manager, dishes up some of the 30 gallons of the restaurant’s famous steaming hot chowder for participants. 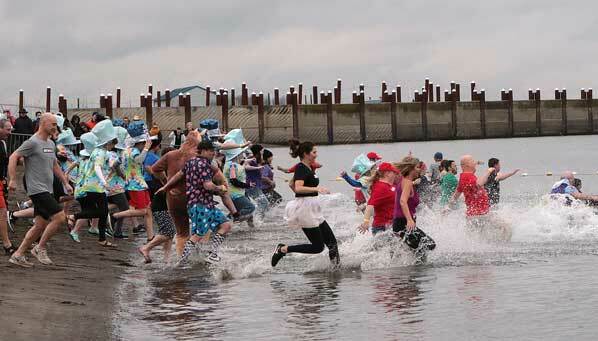 But to the delight of chilly outdoor dippers, on February 23, the event returned at Broughton Beach, just north of Portland International Airport. The idea is simple: To participate in the Polar Plunge, individuals and teams raise funds, permitting them the opportunity to dress in a costume, stroll down the beach, and take a quick dip in the ice-cold Columbia River, and then dash back to the heated “changing tent”. Thanking volunteers and Polar Plungers is SOOR CEO Britt Carlson Oase. 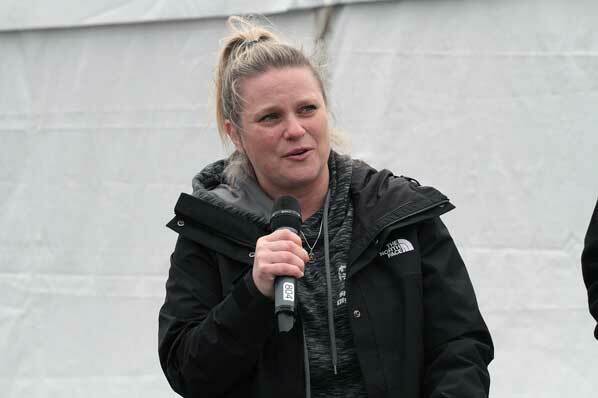 “It’s not over for us, at Oregon Special Olympics,” the organization’s new CEO Britt Carlson Oase assured, at the Polar Plunge. “It’s true, we do have a lot of work to do; we are in a bit of a ‘financial hole’ that we have to dig out of, and we’ve made tremendous progress,” Carlson Oase candidly told East Portland News. 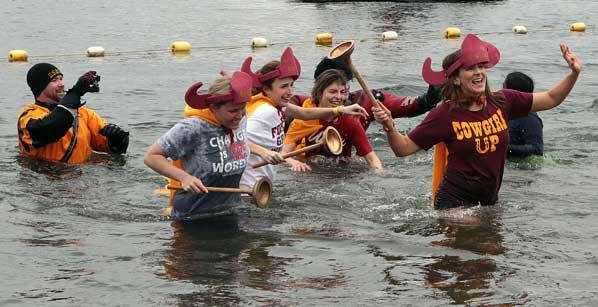 This year’s Super Plungers gather for a group photo moments before heading for the last of 24 nippy dips. 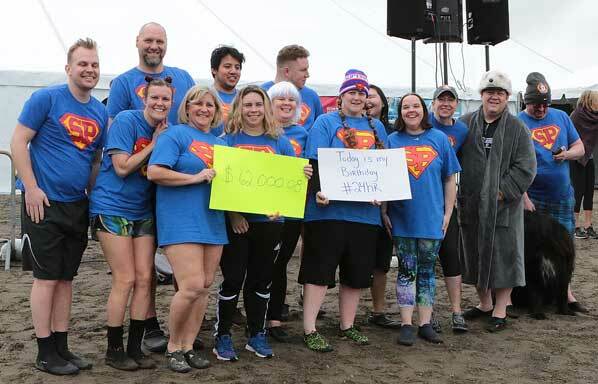 Just before the first wave of this year’s Polar Plunge participants were released, 15 “Super Plungers” – those who raised funds urging them to take a dip once an hour, for 24 hours – took their last brief swim, raising a combined total of $62,000.08 for the cause. “But now, especially being here today, we’re seeing the light at the end of the tunnel, thanks to the support of the community, philanthropy, and donors who have rallied around us in support,” said Ms. Oase. This eager group of Polar Plungers heads into the water. Dive teams both from Multnomah County Sheriff’s Office and Clackamas County Sheriff’s Office stand ready, in case a member of this team, the Super Vikings, need assistance. “Today, with the support of at least 1,200 ‘Polar Plungers’, we’re celebrating our mission with so many wonderful volunteers, sponsors, and supporters – it’s giving us a big ‘warm fuzzy’ on a very cold day!” exclaimed Ms. Oase, observing that 450 runners also participated in the concurrent 5K event. 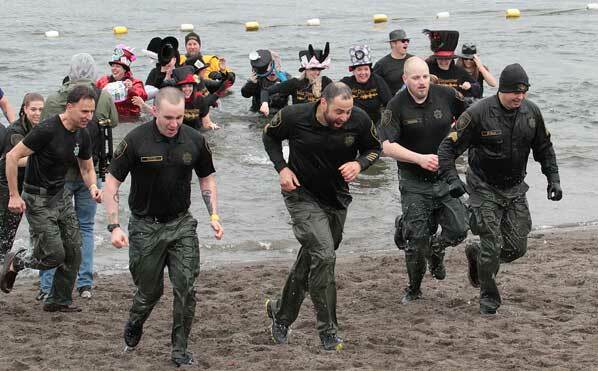 Yes, that’s Multnomah County Sheriff Mike Reese, at far left – with members of his staff – heading out, after their own Polar Plunge. To learn more about Special Olympics Oregon, see their official website: CLICK HERE.